I haven’t done a Retro Friday post in a while because I’ve been busy putting up We Love YA features every Friday. 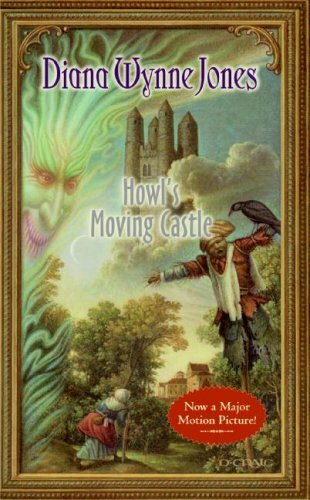 I don’t have a feature ready for today so I decided to write a review from one of my favorites – Howl’s Moving Castle by Diana Wynne Jones. I know I’ve mentioned this book several times here on the blog but I realized that I don’t have a review of it up. I’ve successfully recommended this book to several friends and they’ve all enjoyed reading it. Sophie has the great misfortune of being the eldest of three daughters, destined to fail miserably should she ever leave home to seek her fate. But when she unwittingly attracts the ire of the Witch of the Waste, Sophie finds herself under a horrid spell that transforms her into an old lady. Her only chance at breaking it lies in the ever-moving castle in the hills: the Wizard Howl’s castle. To untangle the enchantment, Sophie must handle the heartless Howl, strike a bargain with a fire demon, and meet the Witch of the Waste head-on. Along the way, she discovers that there’s far more to Howl — and herself — than first meets the eye. “Who, me?” said Howl. “I assure you, my friends, I am cone sold sober.” He got up and stalked upstairs, feeling for the wall as if he thought it might escape him unless he kept in touch with it. His bedroom door did escape him. “What a lie that was!” Howl remarked as he walked into the wall. “My shining dishonesty will be the salvation of me.” He walked into the wall several times more, in several different places, before he discovered his bedroom door and crashed his way through it. Sophie could hear him falling about, saying that his bed was dodging. This was the first ever DWJ book that I ever read. Later on, I learned that it was DWJ who gave MWT (Megan Whalen Turner) a leg up in the publishing world so we have her to thank for the wonderful Queen’s Thief series. Maybe that’s why both Howl and Gen are so awesome? As proven by the fact that they were the last two standing in the recently concluded YA Fantasy Showdown. I already have several other DWJ books in my TBR and I know I’ll enjoy reading them as much as I enjoyed Howl’s story. I’ve seen the Hayao Miyazaki film version and although it’s very different from the book, I also liked it. So that’s where the “what a lie that was” line is. Howl’s Moving Castle was one of the first YA books I read this year. Come to think of it, I think this was one of the reasons why I started reading more YA! I wanted to put the quote where that line appears because that’s the line that appears in The King of Attolia plus it’s pretty funny. I think once you fall in love with a YA book, that’s when you start to become more curious about the genre and you explore other books out there. Have you read the two companion novels to this book? That’s true, if not for this book, I might not have explored YA…and I wouldn’t have been introduced to your blog! I’ve only read The House of Many Ways. I wasn’t really that excited to read the other two books because there were new characters, and Howl was hardly in them. :D But I’ve heard good things about Castle in the Air too. Oh the line actually appears in both The Thief and The King of Attolia. I’ll try and look it up when I browse through the books. In The Thief it is after Gen tells the innkeeper’s wife that the prison is not so bad. I remember the one from KoA but thanks for pointing out where it is in The Thief! Oh, I love this one! And Howl! And Miyazaki’s film! And that quote! (I used it in my review, too, because it was just too good not to repeat. 🙂 ) After finishing this one it was a relief to see that there were companion novels; I could never get enough of Howl, so at least he can be revisited in the other books. I love that quote because it shows Howl drunk and the line “What a lie that was!” is in there. I know, it’s good that there are companion novels to this one! I’ve only read House of Many Ways but I do have a copy of Castle in the Air. I’d never read any of Jones’ books until I saw the movie. I then picked up “Howl’s…” and loved it. Have you read the sequel “House of Many Ways”? I liked “Howl’s Moving Castlel” better, but Howl and Sophie were great in “House of Many Ways”. Yes, I’ve read House of Many Ways and I liked it as well. I loved the scenes with Howl and Sophie in them. I haven’t read Castle in the Air though. Hey – you read HOWL!! I’m glad to hear you liked it. I need to track it down for sure now. Thanks for the review and happy Friday! Michelle, I hope you get to read this soon! Have you read any of DWJ’s books? Have you read the two other companion novels to this one? Hmm I wonder what was that DWJ book that you read that you didn’t really like. I have all of the Chrestomanci books but I’ve only read the first two and I also have The Dark Lord of Derkholm. Love it! I wrote a review for Howl’s Moving Castle this week also. Actually for all three Howl books. I am now on a quest to read all of the rest of DWJ’s books as the only other one I’ve read is Fire and Hemlock. I linked your review at the end of my post! Thanks for mentioning it. 🙂 I haven’t even read Fire and Hemlock although I do want to read all of DWJ’s books, especially the Dalemark Chronicles but they’re not available here. Fire and Hemlock is a Tam Lin retelling. It is very different from Howl. It’s rather dark actually. But really good. I’ve never read a retelling of Tam Lin! Hmm okay, thanks for letting me know. I might not read that anytime soon. I still have a lot of other DWJ books to read anyway.